Flow meters are very popular devices that help to determine the quantity of fluids through pipes at any given time. The majority of flow meters are applied in custody transfer applications where a seller of a given fluid –gasoline, natural gas etc needs to make sure that the actual quantity of fluid is being sold to a buyer and of course the buyer needs to ensure that he is getting value for his money by ensuring that he gets the actual quantity of fluid being paid for. Also in many industrial control applications, flow metering is critical to deliver control objectives. So whatever the area of application of your flow meter, you need to understand the terminology used in flow meter specifications and also the accuracy level of the device. Now when it comes to flow meter accuracy, it can get a little tricky and even misleading if you don’t have a thorough understanding of the types of accuracy metrics flow meters manufacturers employ to define their products. A clear understanding of flow meter accuracy is therefore necessary if you must get your flow meter specifications right. This describes the ability of a flow meter to indicate the same value for an identical flow rate on more than one occasion. It should never be confused with accuracy. Good repeatability does not guarantee accuracy. Turn Down or Turn down Ration describes the range of flow rates between maximum and minimum flow over which a flow meter will work satisfactorily within the accuracy limits and repeatability of tolerances specified by the manufacturer. Effective range and Rangeability are alternative terms used to describe meter turn down. For the Orifice plate meter, minimum flow = 25% of maximum flow = 600gpm. This problem of considerable errors at low flow rates due to insufficient turn down is particularly worst for differential pressure flow meters where flow is proportional to the square of pressure. At flow rates below these for the turbine and Coriolis flow meters, the meters can no longer give accurate measurements. So it is important to do proper flow study for your application to enable you select a flow meter technology with the sufficient turn down to meet the range of flow rates expected for your application. This is a measure of a flow meter's performance. It is the amount of error that can occur when measurements are taken with the flow meter. Flow meter accuracy determines how precise or correct flow measurements are to the actual value or flow rate and is used to determine the suitability of the flow meter for a particular application. As revealed by the graph, the % Rate Error between the range of low flows and high flows remains constant. As shown from this example, while the error is constant at any given flow, the error expressed as a percent of flow rate increases with a decrease in flow rate. This is not desirable because at low flow, the errors become considerable. 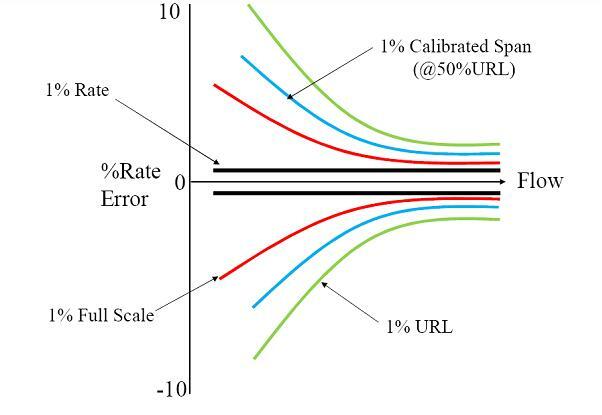 (b) A calibrated span statement becomes a full scale statement when the instrument is calibrated to full scale. 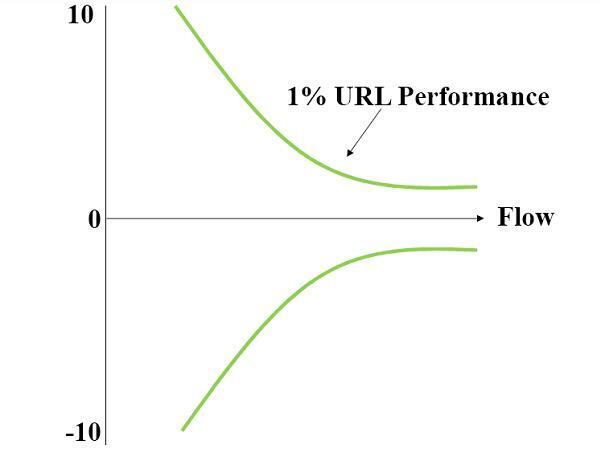 From the discussions so far, it should be noted that flowmeter Performance specified as a percent of rate (%R), percent of full scale (%FS), percent of URL (%URL), and percent of calibrated span (%CS) are different and must not be confused with each other. In preparing flowmeter accuracy specifications therefore, all accuracy statements should be converted into uniform % actual flow rate and these % actual flow requirements should be specified separately for minimum, normal, and maximum flows. In this way, one will truly appreciate the magnitude of the errors at the various flow levels – minimum, normal and maximum flows- and therefore determine which flowmeter is best for their application.